Julian is a Didjeridu Teacher,Healer and Performer with a passionate interest in Aboriginal Culture and music. His journey with the Yidaki ,(Didjeridu), started 24 years ago,with an introduction to Noongar Didjeridu player Dereck Nannup by Heath Bergerson. After being greatly inspired by their playing Julian began studying various playing styles from around Australia. In 1997 Julian was invited to the Northern Territory in Australia’s top end by an Aboriginal central desert to make, demonstrate and teach the Didjeridu. It was there he met Arnhemland people who taught him traditional techniques and rhythms that are thousands of years old in their origin. While living in the Northern Territory Julian was adopted by two Arnhemland families who both have an ancient lineage to the Didjeridu,(Mago) and Yidaki traditions. Julian visited a Chief Ceremonial Elder and Master Didjeridu,(Mago) player-David Blanasi who taught him specific rhythms and songs that connect the player very deeply with nature.David encouraged Julian to learn the traditional playing accurately. 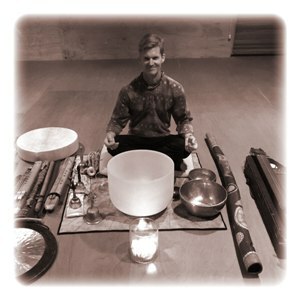 We are very honoured here at The Sound Temple to have Julian as part of our regular Sound Healing Facilitator Team here in the Perth Hills.